The last in a 4 part series featuring editors that run their own imprints. If you write picture books with a historical bent, it’s important that you get to know Carolyn Yoder’s work. 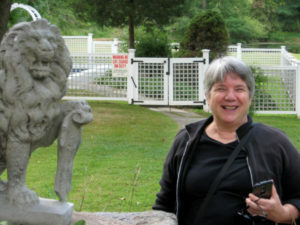 Carolyn P. Yoder is the senior editor of Calkins Creek Books, the U.S. history imprint of Boyds Mills Press, a Highlights Company. 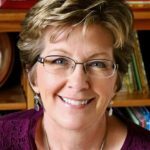 She publishes nonfiction and historical fiction picture books and novels. Calkins Creek titles have won numerous awards, most notably the Sibert Honor, the Jane Addams Book Award, and the Orbis Pictus Honor. She is a genius on all aspects of American history, and a stickler for accuracy (I know, I work for her!) who never forgets the emotional core of a story. What do you think picture books provide young readers that other genres don’t? At Calkins Creek, picture books offer a powerful JOLT of history—a familiarity or connection to encourage readers to learn more about the people or events covered. Simply put, picture books should bring history to life! What kind of picture book manuscripts are you drawn to and why? picture books to offer unusual slants or perspectives on a well-known individual or an event or offer a look into an individual or event not so well known. 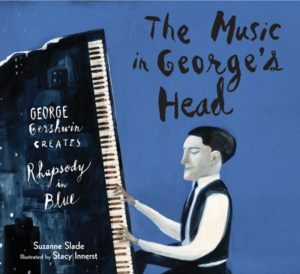 We just completed a picture book on George Gershwin (The Music in George’s Head), a widely known musician (but probably not to young readers) and looked into what made him tick—what led to his masterpiece, Rhapsody in Blue. The idea that an artist can be inspired from an early age is relevant to kids today. What are your biggest challenges as an editor? I hope every author would want to “discuss” his or her work – to make the best book possible. To be able to SEE all the perspectives of bookmaking – that’s what an editor can offer. I tend to not only look at the writing, but because Calkins Creeks is devoted to American history, to the historical context of the story. The weaving in of the “times,” is perhaps the hardest thing to get right in a picture book. What to leave in and out of the research. History needs to be right and exciting to kids. Balancing research and story is hard, but essential. Another tricky part is the illustration—how the book will be represented in pictures. What should be illustrated and whose style is the perfect complement to the author’s words. As an editor, I work very closely with the art director, editorial director, creative director as well as with the illustrator, author and outside experts in the field. The picture book author is a very big part of the art process – in all the major stages. The art and words must be in unison to create a powerful whole. What do you most wish beginning picture book authors understood? The weaker manuscripts have too much research, too little story. Or not enough research. The story is in the research. The story is in the details. I used to say who needs another picture book on George Washington or Thomas Jefferson but no more! We just published a book on how Jefferson grew all things – from gardens, to scientific thought, to our country, etc. And Washington factors in in an upcoming picture book on Benedict Arnold and John Andre called Revolutionary Rogues. Who doesn’t like to uncover NEW things and NEW people, but also NEW things about OLD people or topics. That’s one of the beauties of history and one of the goals of Calkins Creek. Which upcoming picture books in your list are you most excited about? We are a small imprint and publish nonfiction, long form; historical fiction novels; along with nonfiction and historical fiction picture books. That said, the spring of 2018 will be an outstanding season for Calkins Creek picture books. We have three scheduled. All on relatively unknown individuals. Born to Swing by Mara Rockliff and illustrated by Michele Wood about the jazz musician Lil Hardin Armstrong; A Lady Has the Floor by Kate Hannigan and illustrated by Alison Jay about presidential candidate Belva Lockwood; and Blue Grass Boy by Barb Rosenstock and illustrated by Edwin Fotheringham about musician Bill Monroe. All three pinpoint the sparks that lead these individuals to become who they were. Their stories are not only inspiring and energizing but also totally relevant to kids growing up today. 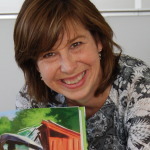 Thanks Carolyn for your time and your contribution to great picture book literature for children! Another great interview. Thanks, Barb, and congrats on the upcoming book! I just started researching for a historical picture book, so this is good to know! Carolyn is simply the best history editor I’ve ever met! Hope this was helpful. A great interview, thanks so much, Barb. It is so wonderful to get to know these editors. Carolyn sounds like a dream editor for me. She’s a great editor and an even better person! You couldn’t have chosen anyone more knowledgeable for this interview. Carolyn Yoder really knows her stuff and is great at sharing it with writers in all stages of their careers. Thanks for an interesting post. Terrific interview, Barb (and Carolyn!). Would love to work on a project with her someday. Love Carolyn and all her great advice. Thanks for the interview with her, Barb. Great interview with a superb editor! I don’t write picture books, but all historical works benefit from her insight. Wonderful interview and details about Carolyn. Thank you!